Even the Sky is not the limit. Almost a year ago, I said yes to a voluntary work that I didn’t know how much would change my life. I helped two of my good friends in organising a hackathon in AI. It was the extension of the weekend of “France is AI” and it was the first time that I was really exposed to AI topics. I can’t tell how exciting everything was to me! I was learning lot of new things and new words: NLP, Deep Learning, Machine Learning, Conversational Bot. I even learned how to fill up a Machine Learning canvas! There were only 4 women among the +80 participants. Even in the organising team we were only two. I still laugh at this video, but this is actually how everything started! Sometimes a simple question make you realise about the problem. One of the mentors, Louis Dorard, who was working on a new episode for his Vlog asked me and my colleague, what we thought about diversity in AI, why there were so few women attending our event, and how we could change this. I had never thought about these issues before. That was then the idea of Women in AI first came up. Since that day, my passion for AI started to grow. I started to dig more into different topics of AI and to attend many AI meetups, Hackathons and Chatbot after-works. All these events had two things in common: majority of men attendees with technical background, and dominated stages by men. One of these events was the Startup Weekend AI. It was one of the best experiences that I’ve ever had from a Startup Weekend. We had a great team (although I was the only woman from our team of 7!). 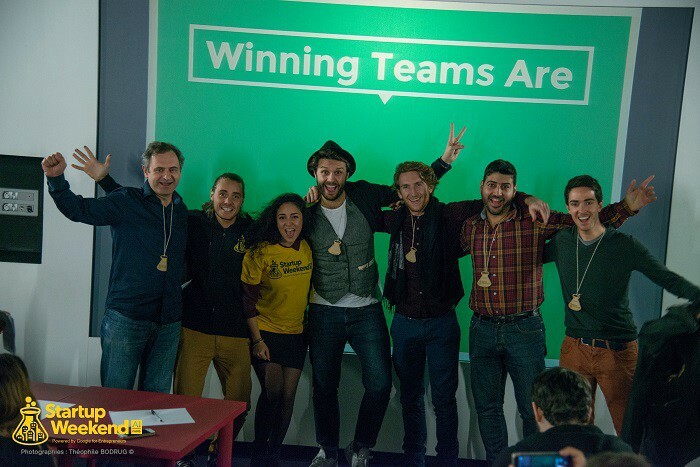 After 54h of hard work and sleeping on 42’s floor, we won the jury’s special prize! It was at that weekend that I met Hanan, who was a PhD in AI and expert in Robotics, and by far the most expert person in the room. Through our conversations, we naturally reached to the idea of a female club, “a safe place for women to talk and exchange about AI topics”. We started with a simple Facebook group with a few girls who liked the idea. That’s how our initial team got together. We had some members who were very beginners in AI but were highly motivated to learn, while we had some more expert members who were eager to share their knowledge with others. Like all technologies, artificial intelligence will reflect the values of its creators. AI uses the data that its creator feeds it and will pass on the biases of its creators. We are deploying data driven assessment tools almost every where now in our work. If we are becoming so dependent on them, then our decision making will impact that part of the population whose data is not taken into the system. And this is the problem! The first role of AI is to be personalized and make the life better for everyone. Our world is made up of biases. Even with the hardest efforts, we will still be biased human beings. It is thus important that teams building the future of our world with AI applications embrace internal diversity as much as they can, in order to create an inclusive AI and represent a right image of a multi-cultural society. That’s why we need not only more Women in AI, but more diversity in general. This can extend to the skin colour, religion, education, country, family, age and etc. In all the events and conferences about AI, like all the conferences in STEM, there is a lack of women speakers. We don’t see enough women as experts and leaders on the stage talking about ideas and world changing projects. 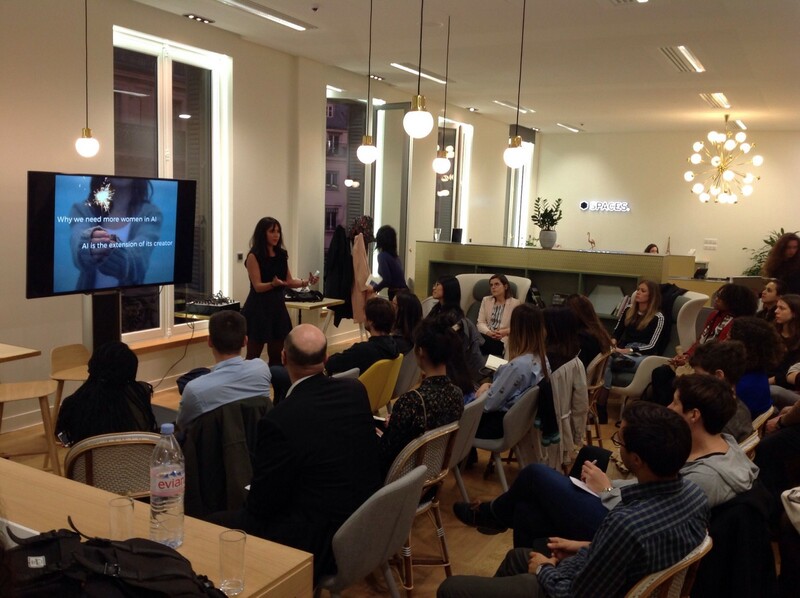 We wanted to create an environment where women own the stage and present inspiring ideas. The reality is that there are women experts in AI and Tech, and there are actually a lot of them (here’s a directory of Women in Machine Learning for instance). But they are not visible as much as their male peers. That’s why we focus on events, to put the light on those women who are great for what they do. 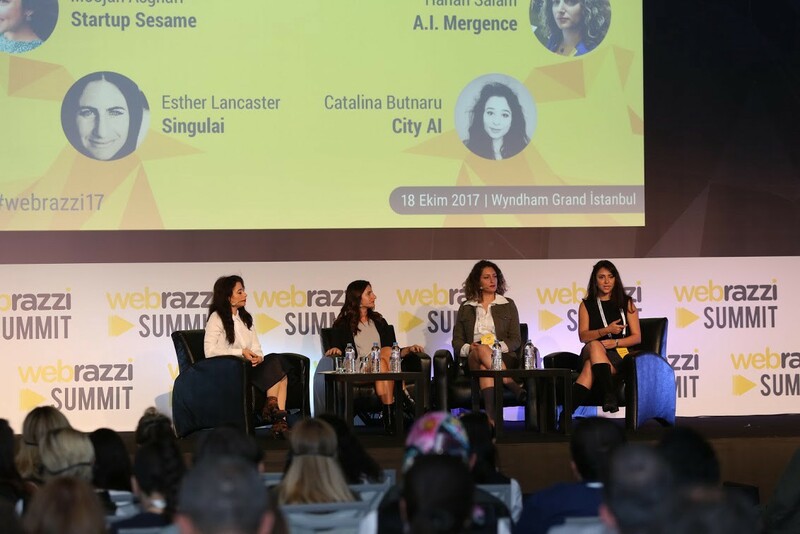 We organise WeTALK, our regular format of thematic meetup in different cities and each time with two amazing women speakers. 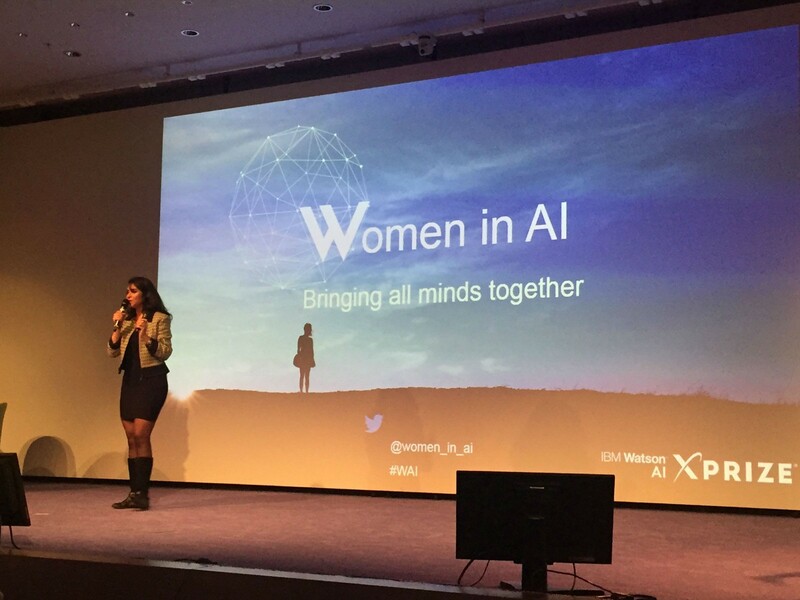 We also help other events with recommending them great female speakers with specific expertise in AI from our community. This is where the source of the problem lies. Many women who have the expertise or the experience in the field, do not step forward to speak up. As a woman coming from Middle East, I’ve always been told what I can do, but more often, what I CANNOT do. Sometimes it’s hard to deal with external pressure, especially when you are a woman. But it all comes to what I believe that I am capable of doing, no matter what the whole world is telling me. Public speaking is identified as the fear number 1 in the world (event before death) by 75% the people. When it comes to the gender point of view, this percentage is higher for women. I would never think that I would one day speak on a stage and give a 15' presentation in front of 400 people before this year (that was later at AIXprize in Nov 2017). Even the thinking of it would make me want to jump out of the window. But I did what we call it “Swallowing the frog”. Surprisingly it was easier than I was expecting. I’ve been doing thi over and over again. Still, I don’t consider myself a speaker and I think I’m far from being a good one, but I believe the key to get there is actually to “fail”. Women want to be always perfect when they are under the spotlight, while men just fake it until make it. Sometimes we just need to swallow the frog. Nobody is perfect in this world. You can get better only by failing more. This all come to the main topic which is “education”. The whole educational system is biased. Teachers don’t behave the same to girls as to boys at schools. When students reach a point where they need to choose their major, there are so many factors that makes young girl students to choose non-engineering majors compared to boys. “My teacher at school didn’t believe that I can do engineering. She was telling me that engineering is not for girls and I should study marketing or fashion. I didn’t listen to her, studied engineering and today I’m the only women in our team at Microsoft”, Dipty Chander, also the president of E-mma. For this reason, we are organising field trips for teenage girls between 8 and 15, before they actually go through any major orientation, in order to help them understand the different engineering, Tech, IT career options. The first Global Community of Women in Artificial Intelligence and we are on the mission to close the gender gap in this field. This is mostly thanks to these great people: Hanan Salam and Caroline Lair, the two other cofounders of Women in AI, Catalina Butnaru (UK), Ewelina Wołoszyn (Poland), Alexandra Petrus (Romania) & Simona Nickman (NL), our amazing ambassadors who are doing a great job in pulling up the AI ecosystem in their cities. If you are interested in building the future of AI, join our community, come and meet us at our net WeTALK or WAI Dinner and follow our event calendar.